Richard Hawkins (or Haukyns) was born in 1611. He became a heraldic painter and “paynte stayner” of All Saints parish. The accounts of the Vice-Chancellor show that Hawkins did some work about the porch and gates of St Mary-the-Virgin Church in 1637/8, and that in 1641 he was paid £3 for painting the south dial on the Schools. probably died aged 7 months, as one of that name buried there on 24 March 1645/6). Probably another daughter who married a man called Wise. Hawkins served as Constable for the South-East ward in 1642/3, and on 1 October 1646 was elected on to the Common Council. On 1 October 1649 he was chosen as Mayor’s Chamberlain by the new mayor, George Potter. Apprentices of Hawkins admitted free included William Pilgrim (15 September 1651), John Rixon (12 March 1660), and Richard Good (17 April 1663). In the council year 1658/9 Hawkins was paid £16 13s. 0d. for painting the arms of the King in various places in the City. On 12 June 1660 Hawkins contributed five shillings to enable him to join the Mayor in the entertainment of Lord Falkland; and on 19 March 1661 he and others expressed their willingness to provide their own liveries in order to accompany the Mayor to the Coronation of Charles II. On 17 September 1661 Hawkins was elected Junior Bailiff at the age of 50, when he had already served on the council for fifteen years. Soon after his death, the executor sent to Richard Hawkins, a herald-painter of Oxford, for a coat of armes to be put on his hearse; but Sir Edward Walker, Garter King of Armes, lodging then in the said Hawkins his house assigned the first of these two coates for him. Wood records that on 3 September 1667 he paid three shillings to “Hawkins the painter for painting the chamber and window”, and on 23 December 1669 four shillings for drawing his arms on vellum. Hawkins was obviously an expert on coats of arms, as twice Wood wrote in his diary “Quaere Mr Hawkins” when he was uncertain about someone’s arms. In 1668/9 Hawkins was paid £19 12s. for some painting work he did in the Divinity School. Richard Hawkins’s son John Hawkins died when a young married man aged 31, and was buried at All Saints Church on 1 October 1667. His wife Alice Hawkins was buried at All Saints Church on 25 November 1671. On 6 September 1678, seventeen years after being appointed Chamberlain, Richard Hawkins was elected one of the Mayor’s eight Assistants. He failed to attend the meeting take the usual oaths, and it was agreed that if he did not appear at the next council and take the oaths, then he should be fined £100 to be levied by distress, or be proceeded against as counsel should advise. He duly turned up on 13 September and asked that he might be allowed to pay the fine and be excused from serving as Assistant. There was a full debate, and it was agreed to fine him £20 and cancel the earlier, larger fine. In about 1674 he took on Daniel Webb as his apprentice. On 23 February 1678/9 Webb married Anne Hawkins, his granddaughter. John Hawkyns, one of the Bible clerks of Mert. Coll., died in the house of his grandfather Richard Hawkyns, a painter-stayner, one of the 13 of the Mayor’s Asociats of the city of Oxon, and was buried, Su., March 30, in the north churchyard of All Saints church Oxon. On 31 March 1682 Richard Hawkins was again elected one of the Assistants, and this time he agreed to serve and took the oaths, so his earlier fine was remitted to him by the City Treasurer. In 1683 Hawkins was paid £4 16s. 8d. for painting the Repository of the Ashmolean Museum in its old Broad Street building. 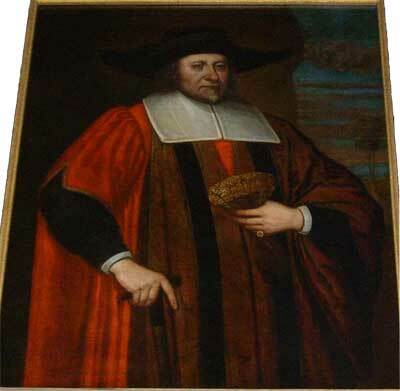 On 16 September 1689, at the grand old age of 78, Hawkins was elected Mayor of Oxford (for 1689/90). It was agreed that all fines set on the Mayor elect (including one of £2 for missing a council meeting in August) and all distresses taken from him were to be remitted and restored to him. Hawkins chose his former apprentice Daniel Webb to be his Child, and Richard Colton to be his Chamberlain. During his year of office Hawkins was made an Alderman (for the North West ward), and he took the oaths and paid £5 on 22 May 1690. On 24 February 1692, when he was 81, Hawkins was still working: Wood records that on that day he was making a scutcheon for Jordan of Witney. The following year Hawkins appeared at Anthony Wood’s trial for libel. In 1694 Hawkins, still going strong at the age of 84, gave the sum of £100 to the City to produce £4 a year for ever to two poor freemen, or freemen’s widows, and his name was entered in the Benefactors’ Book. One of these freemen had to live in St Peter-in-the-East parish and be over the age of 60, while the other had to live in All Saints parish and was to be nominated by the Mayor and his Council. In 1694 Wood (III: 485) mentions a water trench that was dug from Carfax to the Bocherew (Queen Street) and “thence as far as the Flying Horse belonging to alderman Hawkyns”. This inn was at 6 Queen Street. In 1696 Hawkins was paying tax on ten windows at 116 High Street. Peshall mentions a portrait of Alderman Hawkins that used to hang in a meeting room in the old Guildhall, which is presumably the one now in the Town Hall. † Alderman Richard Hawkins died in 1699 at the age of 88 and was buried at All Saints Church on 10 November that year. He left most of his property to Daniel Webb, the husband of his granddaughter Anne. He also gave the reversion of a property in St Peter-le-Bailey parish, the profits to pay for the doles he had established in 1694, a bread charity in the same two parishes, and money for the almsmen of St Bartholomew’s Hospital.